“In a time of destruction, create something,” says writer Maxine Hong Kingston. Create something – even drawing a scathing cartoon would be better than not creating. Create a fantastic apple tart from the season’s riches, or a Catalan dish of seafood, chocolate and dried peppers. Create Legos in a Duchamp-like urinal and post it on Instagram, like Chinese artist Ai Weiwei did this week. 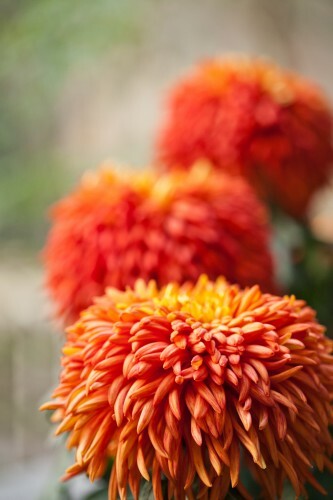 For its autumn courtyard, the Isabella Gardner Museum in Boston cultivated unique Japanese-style single-stem chrysanthemums called ogiku. Don’t create boycotts. Creating boycotts is destroying. It closes the door on a range of voices, visions and human connections. Above all, don’t create cultural boycotts that have a stench of censorship, and label a gangly group of creative artists as somehow, same enemy. Today, 434 British academics signed a petition vowing to boycott Israeli universities. It undermines the very idea of the university as a creative platform, unpredetermined, like a poem, where unexpected elements mix and are left to collide in ways which reveal new relationships and possibilities. It targets the very people that a cosmopolitan community wants to hear: those with supple minds and hearts. There’s a tremendous yearning to calm vengefulness, bath again in sanity, restore possibilities. But do it creatively, not with zealotry. All zealots begins to look the same. As Bradley Burston, an Israeli journalist, wrote in a despairing column about his country, the new battle is not between Arabs and Jews, but extremists and humans. So, what are you going create? This entry was posted in Uncategorized and tagged #Israel, Ai Weiwei, BDS, Bradley Burston, British academics boycott, Cate Marvin, Haaretz, Isabella Stewart Gardner Museum, Israeli-Palestinian conflict, Lego, Maxine Hong Kingston. Bookmark the permalink. This opposition between extremists and humans is very relevant. The main opposition of today, if you ask me.